This guide is written by Binkenstein, a theorycrafter, guide writer and all round mathy type for Elemental Shaman. He is based in New Zealand, currently raids with Fatigue on Nagrand, and has been working on Elemental since mid-way through Burning Crusade (played Restoration up until then). 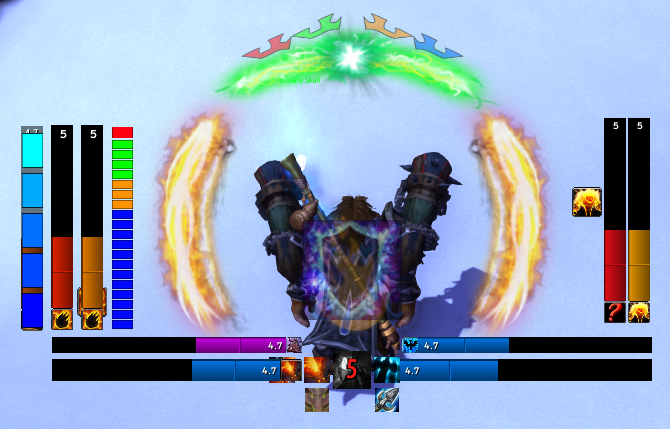 Elemental is the ranged spell caster specialisation for Shaman, providing decent single target damage with excellent AoE/Cleave potential and a variety of utility abilities. The rotation revolves around managing the shared Earth Shock & Flame Shock cooldown, maximising the use of Lava Burst, and managing the number of Lightning Shield charges. If Flame Shock is not on your target, cast it. If Lightning Shield is at 20 charges, cast Earth Shock. Cast Lava Burst if it is available and Flame Shock is on your target. Cast Earth Shock if you have 15 or more Lightning Shield charges, or 12 charges with the T17 4pc bonus. Cast Flame Shock if the remaining duration on the current dot is less than 9 seconds, and it is off cooldown. If Unleashed Fury is talented, cast Unleash Flame. Run the single target rotation, but substitute Chain Lightning (unglyphed) for Lightning Bolt if the targets are close together & consider dropping Unleashed Fury if it is talented. Multi-dotting Flame Shock can result in a DPS increase, as long as no Lightning Shield charges are wasted and the damage to the secondary target isn’t wasted/padding. Usually this means multidot or cleave, not both. The priority for Earthquake & Earth Shock can be reversed when using Echo of the Elements, but only if there are less than 2 charges for Earthquake and T17 2pc is in use. This is because it will improve the uptime of the 2pc bonus while not affecting Earthquake frequency. 1.) If Flame Shock is not on your target, cast it. If Flame Shock is on the target it grants an extra 50% damage for Lava Burst and can generate Lava Surge procs. 2.) If Lightning Shield is at 20 charges, cast Earth Shock. This is to avoid wasting shield charge generation, and should be a rare occurrence if the rest of the rotation is managed correctly. 3.) Cast Lava Burst if it is available and Flame Shock is on your target. 4.) Cast Earth Shock if you have 15 or more Lightning Shield charges, or 12 charges with the T17 4pc bonus. The 15+ figure is the optimal count for minimising Earth Shock casts while also minimising wasting potential shield charges being at the max stack of 20. If you do have the T17 4pc bonus & take Echo of the Elements, try to time your Earth Shock cast just after using Lava Burst or at least 2 seconds prior to the next Lava Burst charge refresh. 5.) Cast Flame Shock if the remaining duration on the current dot is less than 9 seconds, and it is off cooldown. 8.) If Unleashed Fury is talented, cast Unleash Flame. This is lower in the rotation so that fewer non affected spells are cast while it is up, maximising effectiveness even though the uptime is also slightly reduced. A recommended default talent set, useful for all situations. Nature’s Guardian has some upsides and downsides. While it is a passive and automatically kicks in when you dip under 30% health, it doesn’t do much to mitigate damage coming in. It behaves more like the Guardian Druids Ursa Major or the Protection Warriors Last Stand, increasing your capability to take damage & reducing potential overhealing. When the buff expires you retain your current health pool percentage, so if you are at 75% hp with the buff up, you’ll still be at 75% hp when the buff expires, even if it lowers your current and total health. It is for these reasons that Nature’s Guardian is ideal for either unpredictable damage spikes or as a defensive passive which requires little attention. It can also be ideal for newer players who aren’t as familiar with all the abilities & talents of the spec. Stone Bulwark Totem is more suited towards lower but more frequent damage, which can vary from raid wide damage to questing. The maximum damage absorbed will be 700% of your spellpower, meaning that it can absorb damage roughly equivalent to 1.7 Healing Surge casts. As it is an Earth totem it cannot be used at the same time as other Earth totems unless you talent into Totemic Persistence. Astral Shift allows players to reduce a high damage burst. It can be stacked with Shamanistic Rage to reduce damage further, although they will multiply together, eg: (1 – 0.4) * (1 – 0.3) = 0.42, so that you can never completely reduce the damage of an ability to zero. Not an ideal talent for Elemental, but Frozen Power can be taken if a single target root is required on a more frequent basis than what Earthgrab Totem can provide. The down side is that using Frost Shock on a frequent basis for kitting will mean being unable to use either Earth Shock or Flame Shock at the same time, often requiring a bit of balancing between the three shocks. Can be combined with Glyph of Frost Shock to effectively make the root permanent, unless diminishing returns or immunities are involved. This is a replacement for Earthbind Totem, adding a 5 second root to any targets affected by the totem. As with Earthbind Totem, effective use of Earthgrab Totem often requires taking Totemic Projection as the Tier 3 talent to allow effective placement of the totem. As the complete opposite of the other Tier 2 talents, Windwalk Totem focuses on freeing/protecting allies from slow & root effects rather than rooting the enemy. The end result is that this will be quite valuable for PvP, and occasionally required for PvE encounters as well. Call of the Elements is limited to resetting the cooldown for Capacitor Totem, Earthbind Totem, Grounding Totem, Healing Stream Totem, and Tremor Totem, as well as the talents Earthgrab Totem, Stone Bulwark Totem & Windwalk Totem. Primarily useful when one of these short duration totems is needed more frequently than the cooldown would otherwise allow. Totemic Persistence allows a second Air, Earth or Water totem to be dropped without destroying the first. There aren’t many overlaps for Elemental Shaman in these element totem categories, so this talent will usually be skipped. Elemental Mastery is the DPS cooldown ability of this tier. It lends itself towards situations which require burst DPS, but because of the 2 minute cooldown it can’t be matched up to other DPS cooldowns like Ascendance or Fire Elemental Totem. Should be used on cooldown where it isn’t required for specific burn phases. The value of Elemental Mastery varies a bit, sometimes being slightly better, sometimes slightly worse than Ancestral Swiftness or Echo of the Elements depending on the length of the fight. The best duration will be slightly over a multiple of 2 minutes, but this also assumes no cooldown waste or saving it for specific burn phases. Despite this, it is still a perfectly valid talent choice for mid to expert level players. Ancestral Swiftness has the same effective haste as Elemental Mastery (30% * (20/120) = 5%). Since the haste bonus is passive rather than a cooldown it means that it will interact with other cooldowns, just on a smaller scale. The active ability, similar to the Nature’s Swiftness ability for Restoration Druids, allows any nature spell with a cast time of less than 10 seconds to become an instant cast. The less than 10 second limitation is to prevent it from being used with both Ancestral Spirit or Astral Recall. Affected spells include Chain Lightning, Earthquake, Elemental Blast, Healing Rain, Healing Surge, and Lightning Bolt. Echo of the Elements converts Earthquake and Lava Burst into charge based abilities, rather than cooldown based, granting 2 charges for each that refresh at the normal cooldown rate. The advantage of this talent is that it allows you to cast Lava Burst at a higher frequency, and cast two Earthquake spells at the beginning of an AoE phase (both copies will deal damage). Echo of the Elements is roughly as good as Ancestral Swiftness or Elemental Mastery. Can potentially deal more AoE damage, but this requires more bursty AoE phases. Best for mid to expert level players. Is easily the best talent of the tier when combined with the T17 4pc bonus. Rushing Streams gives a minor boost to the healing of Healing Stream Totem of around 35% SP. If healing two targets the value of the total heal increases from around 230% SP base to 533%. Has the highest maintenance cost of all three talents. Best used in solo or small group situations where the additional target is a significant increase. Can also be used on moderate to high mobility fights, where you will have spare time while moving to re-drop it. Ancestral Guidance should ideally be used with DPS cooldowns like Ascendance for maximum effect. This can turn Ancestral Guidance from a minor top up heal to a minor to medium raid cooldown. On average isn’t much more effective at healing that the other talents in this tier, although it can be activated without a global cooldown or cast time cost like the others. Conductivity can heal in the range of 280% SP per target with a single 40 second duration Healing Rain. It requires at least 8 casts to extend out to the maximum duration. Only really effective when group healing is required. With the cast time for Healing Rain it will require some maintenance, but the trade off can be worth it for the additional healing if the group/raid is stacked & won’t move very often. Unleashed Fury increases the damage of both Lava Burst and Lightning Bolt. As it requires making Unleash Flame part of the stationary single target rotation, this talent doesn’t work well when you want to take advantage of Enhanced Unleash to move quickly. This is because in order to take full advantage of the speed boost you’ll be wasting 40% of the buff uptime unless you’re lucky with Lava Surge procs. Mathematically, Unleashed Fury is the best level 90 talent when considering stationary single target DPS. This advantage will diminish as movement requirements increase, due to that Enhanced Unleash drawback mentioned above, which means not taking Unleashed Fury a practical choice. It’s possible to make up the difference by buffing 1 Lava Burst cast via Unleash Flame every minute, or getting in 1 extra Lightning Bolt cast in the same timeframe. Primal Elementalist affects Earth Elemental Totem, Fire Elemental Totem and Storm Elemental Totem. All elementals gain a pet bar and additional abilities. Fire Elemental Totem: Empower, Immolate and an additional 80% damage. Note that Empower should only ever be used when the Primal Fire Elemental would otherwise be doing nothing. Primal Elementalist pulls ahead of both Elemental Blast and Unleashed Fury based on the effective uptime of Fire Elemental Totem. This means that if the fight lasts between a multiple (X) of the cooldown plus the full duration, up to that same multiple (X) of the cooldown plus another half cooldown (ie: 1 to 2.5 minutes, 6 to 7.5, 11 to 12.5 etc), Primal Elementalist will be the mathematically better talent choice. There are further considerations, like whether more bursty damage is required over sustained damage, but even if you can’t get the fight duration exactly in that optimal window Primal Elementalist is still a viable talent choice. Actual variation range is from +0.7% total DPS at 6 minutes to -0.8% at 10 minutes, which can be halved by using Glyph of Fire Elemental Totem (although this glyph is not recommended). It’s also worth pointing out that Primal Elementalist is the only Tier 6 talent that is just as effective during high movement as it is when stationary, and the only one that can contribute during AoE phases. Elemental Blast has slightly higher damage than Lightning Bolt (145% vs ~119%), generates Lightning Shield charges, and also generates a random 500 point secondary stat buff. Unleash Flame also increases damage, as Elemental Blast is considered “Elemental” damage and benefits from Fire, Frost or Nature bonuses. Elemental Blast is about 85% as effective as Unleashed Fury in purely stationary DPS terms, but will narrow this gap depending on how much movement occurs during an encounter. That 15% difference equates to 0.5% of overall DPS, so Elemental Blast can be considered a perfectly viable talent for this tier. Elemental Fusion affects any shock spell, but only the shocks themselves. This means that Fulmination damage is not affected. Can be stacked with Unleash Flame for extra damage to Flame Shock, which is practical even when stationary. As this talent interacts with Shocks, the effect of movement is fairly minimal, especially if combined with Echo of the Elements to improve buff generation. Can also be used on multi-target fights, although multi-dotting is only practical with two targets. Flame Shock can be re-cast slightly earlier than normal (ie: less than 12 seconds remaining on the dot) if you have Unleash Flame available, two Elemental Fusion charges, and the previous Flame Shock cast was not modified by either. Do not try to do any earlier recasts, or with a lesser buff combination, as this won’t be a net DPS gain. Earth Shock should continue to be cast as seldom as possible while also trying to avoid Lightning Shield charge “loss” (where you have additional generation spells hit after reaching 20 charges). It is okay to waste 1-2 casts worth of Lightning Shield charge generation in order to get a double buffed Flame Shock out. Do not adjust your priority to take advantage of, or generate, additional Elemental Fusion charges. Storm Elemental Totem is another elemental pet totem, similar to Earth Elemental Totem & Fire Elemental Totem. Inherits 100% of the owners spellpower. Primal Elementalist grants two new abilities: Eye of the Storm and Gale Force, but does not grant a damage bonus. Storm Elemental is best in single target fights, or those with higher movement requirements which won’t affect the Storm Elementals damage output. Similar to Primal Elementalist, Storm Elementals effectiveness varies with the fight duration, which is roughly a minute later due to the fact that Fire Elemental use may be delayed. This means windows of 2 to 3.5 minutes, 7 to 8.5, 12 to 13.5 etc will be more ideal for this talent. Should be used before Fire Elemental Totem if you have not taken Primal Elementalist for your Level 90 talent, otherwise the order doesn’t matter. The same rules apply for which to use with Bloodlust. Liquid Magma is both a single target and an AoE cooldown in one. Requires that a fire totem to work, so make sure that one will be up for that long. Best use is to time it with AoE packs, and can easily be delayed as it is more important to get more targets than frequent use. Chain Lightning should be both glyphed and unglyphed depending on the fight conditions. When there are 4 or more targets it is necessary to increase your AoE DPS, while when there are 2 or 3 targets and cleave DPS is viable it is best removed. This glyph can actually reduce the uptime of Fire Elemental Totem. This is because the full uptime every 5 minutes is only achieved at the 3 minute mark with the glyph, vs 1 minute without it. Also requires one additional GCD per 5 minutes to use. Not recommended unless there are very specific burn requirements. Provides a very low level heal, roughly 3% of Spell Power per second, before haste gains. Is a useful glyph to have for progression, or when there is a free glyph slot. Useful on high raid Fire/Frost/Nature damage fights, if you will be dropping Healing Stream Totem frequently. Only procs off the “first” heal from Rushing Streams. Useful if a second Hex is required in less than 45 seconds, but this is mostly only necessary in Challenge Modes. Another glyph that is good for filling a free slot, but is also very useful in encounters where Lightning Shield triggers a lot. Usually this will be encounters where there is a lot of direct damage to the raid, rather than environmental effects. This glyph can be very useful in any situation that requires multiple magic dispels on the raid, or even with magic debuffs that don’t require immediate removal. Doubles the damage reduction of Shamanistic Rage to 60% over 15 seconds, but doubles the cooldown as well. Can be useful depending on the fight conditions. Halves the cooldown of Spiritwalker’s Grace, and nearly halves the duration too (15/2 = 7.5, rounded up to 8). Very useful for anything where a full 15 (or 20) second SWG is too long, which is virtually all boss fights. Adding 5 seconds on to the duration of SWG may not sound like much, but it makes it a 16.67% uptime rather than 13.33%. Only useful when SWG expires too early and isn’t needed more frequently. Reducing the cooldown of Thunderstorm by 10 seconds is only useful in any situation where more knockbacks are useful, which is hardly ever. Can be handy to use when slowing an AoE stack is useful, but make sure to check with tanks before using it. In most cases, PvE encounters don’t use school lockouts, so this glyph will have no impact. Removing the knockback effect removes most of the reason for this spell, as it’s not practical as an AoE spell. Intellect is a primary stat that provides 1 Spell Power (SP) per point. Most Elemental abilities use a percentage of attack power to the damage they deal. Critical Strike increases the chance to critically hit with abilities, dealing 250% of the normal damage. Haste increases spell cast speed. Mastery: Molten Earth The mastery percentage indicates the spell power coefficient that Molten Earth uses for its attacks. Multistrike causes abilities to have a chance to hit a second and a third time, each dealing 40.5% of the initial damage. A spreadsheet for item values can be found here. Searing Totem & Healing Stream Totem are useful during Phase Two for attacking crates in the side corridors, if using the spread out strat. Glyph of Spiritwalker’s Focus is a good idea to use with the belt phases, but if you can master the Plate phase without it, consider taking Glyph of Spiritwalker’s Grace to use with the Stamper phase. The best place to stand is between the outermost two belts on either side of the room. Here you will remain stationary during belt phases, which makes dodging stampers & plates a lot easier. For plates, wait until you need to move then run two belts into the middle with Unleash Flame + Spiritwalker’s Grace, and then back out again. Using Unleash Flame + Ghost Wolf is a good alternative, especially as you’ll be able to stop to cast Lava Burst before making the return trip. For stampers, the position is ideal for moving out of pairs of stampers to either side of you, or running onto the belt for “cross pairs”. Again, Spiritwalker’s Grace is good for movement here, and always try to move “upstream” of a stamper so you can let the belt carry you out of the next one if possible. Level 60: Echo of the Elements will result in slightly higher DPS because of the frequent switches between single target & AoE damage, taking advantage of banked charges. Make sure that a fire totem is up all the time, and recast Searing Totem if it will expire mid Liquid Magma use. It’s still a DPS gain to drop Earthquake on the boss if that’s the only target up and Enhanced Chain Lightning is up. Use Shamanistic Rage to reduce the initial hit from Inferno Slice rather than with Shatter, as the latter doesn’t deal as much damage (if handled correctly). Level 75: Ancestral Guidance is the best choice here, to use with Firestorm for some extra raid healing. No specific glyphs are required for this fight. Remember to interrupt Cauterizing Bolt whenever possible. Level 90: Primal Elementalist is the best choice here, as the frequent AoE damage & movement makes the other two less useful. Glyph of Healing Stream Totem can be useful, especially if you take Rushing Streams, as a lot of the raid damage is Fire based. Make sure you Purge off Reactive Earth Shield unless someone else is specifically tasked with this. Glyph of Lightning Shield is a great choice here, with 40-50% uptime. During the Grasping Earth phase use the normal multi-target rotation to free people as quickly as possible, if Chain Lightning can hit multiple targets. Level 15: Astral Shift is useful for Penetrating Shot or Detonation Sequence. Usually a good idea to cast as you’re returning from the boat too, should you be sent over. Level 60: Echo of the Elements is a must have for this, as it allows freedom to delay Earthquake casts. This means you can cast Earth Shock or Chain Lightning first if needed, while still maintaining a Earthquake high uptime. Level 100: Liquid Magma should be used on cooldown, even if you only have 2 targets. Remove Glyph of Chain Lightning as there are only 3 targets to attack. Either Glyph of Spiritwalker’s Grace or Glyph of Spiritwalker’s Focus can be taken here. Grace is more useful during Bombardment phases, while Focus allows more mobile damage while adjusting for other boss abilities. Earth Shock 20 deals more damage than Flame Shock so multi-dotting isn’t worth it even if you don’t have the T17 2pc bonus. Ascendance should be used on cooldown, prioritising Lava Beam if 3 targets are available (stick with Lava Burst if only 2 are up). Earthquake should still be cast if it is available and Enhanced Chain Lightning is up. Level 100: Elemental Fusion is a good choice here, especially if you multi-dot Siegemakers. Storm Elemental can also be useful here. Event Horizon helps with visualizing the upcoming casts, dots & cooldowns, which is very important for Elemental. I use this in conjunction with my Weak Auras setup (posted further down) so I know what is coming up. The above animation shows the Shadow Priest rotation from Mists of Pandaria, but serves to demonstrate how it works. Originally designed for Enhancement, Hekili was expanded to Elemental and then on to other classes. Prompts the user as to what the next ability to use should be for various different rotation types. Use to cast Ascendance, use both trinkets (if possible) and cast Lava Burst in one button. Note that the values shown for bars after Normal/Stage 1 are the additional DPS for that section, on top of those to the left. eg: Normal + Normal WF + Heroic = Actual Heroic trinket DPS.